As part of the Mayor's cycling vision for London, from today bicycles will now be allowed to officially travel off peak and at weekends on the Docklands Light Railway- opening up a whole new network of multi-modal journey possibilities for cyclists in south and east London. "Opening up the Docklands Light Railway to cyclists will be a great boost to the cycling community and make it much more convenient for cyclists to cross the river. Bicycles were previously banned on the DLR under concerns that they might prove an obstacle should the trains - which largely run on elevated tracks or in sub-surface tunnels - need to be evacuated in an emergency. Emergency trials and a rolling programme of trial journeys last year finally convinced transport bosses that bicycles posed no threat to other passengers. The London Cycling Campaign provided volunteers and advice during the trial, helping to bring thinking around. The DLR network (in mint green) showing connections with the overground rail network - see here for the full network map from TfL. The move will open up two new traffic-free river crossings for cyclists; from Greenwich to Mudchute and from Woolwich to Royal Docks, effectively connecting a number of traffic-free cycling routes and providing an alternative route to the Greenwich and Woolwich pedestrian tunnels which have been beset by closures and delays in recent years due to ongoing refurbishment works. 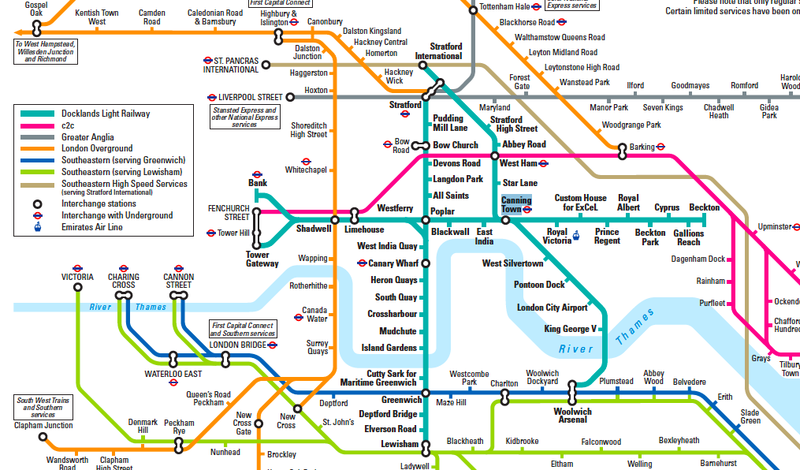 Cyclists will be allowed on the 34 km network off-peak and at weekends, connecting with the rest of the London transport network that allows bicycles onboard at the same times (see PDF map here). However, bicycles will not be permitted in Bank station, where one spur of the DLR terminates. Folding bicycles are permitted on the entire TfL network at any time. Peak hours are 07.30 to 09.30 - 16.00 - 19.00 Monday to Friday, excluding public holidays. With some 70% of all journeys undertaken in London being less than 5 miles, the ability to go "multi modal" and take a short bicycle ride either side of a train journey is a useful tool in the quest to encourage more journeys by bicycle. If - like me - you're afraid you'll melt in the rain, having a bike-friendly transport back up can encourage people to make more cycle journeys when the weather looks like it might go either way; which is about six months in every year in London. We don't often get to say this on ibikelondon but well done to the Mayor and his team for making this change happen. We look forward to more of the same! Next the Croydon trams which TfL still refuse to trial even though TfL appointed consultants said there should be no problems and recommended a trial. Same vehicles as used in Cologne, bikes carried there. It would be good to be able to take bikes on the tramlink off-peak, and it would be a cheap and easy fix to improve the bicycle parking around each of the tram stops. Sadly, I always think that the south London tramline gets somewhat overlooked.